Raith Rovers goalkeeper Dean Lyness. Shot-stopper Dean Lyness was left cursing John Baird after the former Stark’s Park hero spoiled his Raith Rovers debut on Saturday. 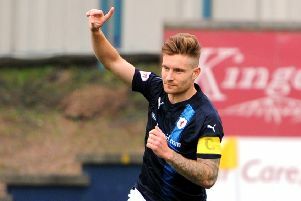 The recently signed goalkeeper displaced Robbie Thomson against Forfar, and was four minutes from a clean sheet when Baird’s volley nestled in his top corner. The 27-year-old Englishman admitted it was a disappointing end to what had been an encouraging first start. “I’m delighted to be here and to get an opportunity to play, it’s just frustrating we couldn’t come off the pitch with a win,” he said. “He’s hit it well to be fair. It’s one of them when he strikes it you know you’re in trouble. “I made a couple of saves in the first half but that’s what I’m here for – to keep the ball out the net. “It’s so frustrating that a game we’re in complete control of, we’ve not seen it out to get the three points. “We’ve created all the chances and one ball has beat us. We’ve just got to stick at it, and find a way to win. Lyness expected to have to bide his time at Raith after watching his rival Thomson produce outstanding recent performances against Airdrie and Dunfermline. “Of course, I knew that coming in,” he said. “Robbie’s a good goalkeeper and he’s played a lot of football. “We’re here to get the best out of each other – in training and on matchday. Lyness has played in a Wembley play-off final for Burton Albion, and he hopes to bring that experience to Stark’s Park. “That’s what football is about,” he said. “You want to play in big games in front of big crowds and be successful. “What success there will be for us this season, we’ll find out over the next couple of months. Lyness stepped down from the Premiership to join Raith following his release from St Mirren, but it was a drop he was happy to make. “When the manager called he was really enthusiastic about what Raith could achieve as a club,” he said. “I did a bit of work here earlier in season under the previous manager, who gave me the opportunity to come in and train to stay fit when I didn’t have a club, so I knew enough about the club and I was more than happy to come and sign. Lyness is looking forward to testing himself against Hibs this Saturday when Raith travel to Easter Road in the Scottish Cup fifth round. “It will be tough but it’s a good game for the club and for the supporters to go there and see us against a Premiership team,” he said.